The Finest World Class Wildlife Original Wood Bird Carvings! Highly detailed carved and painted bird sculptures. 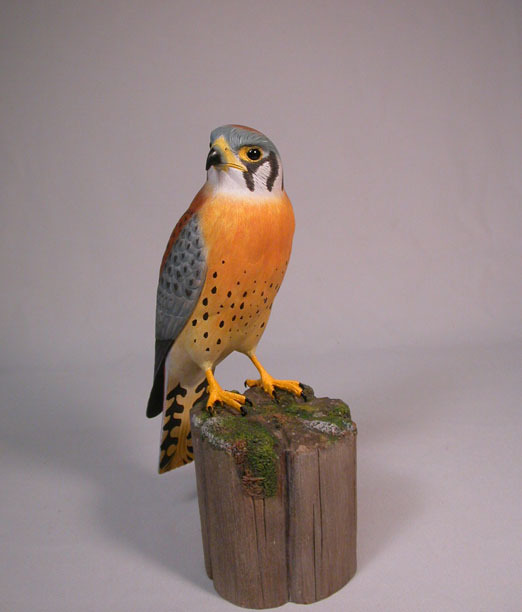 All of the birds in our collection are original and hand carved out of solid basswood. Both birds and base are finished with acrylic paints. Glass eyes and feet are made from bronze. Each carving is signed by the artist and no two birds are exactly the same. Each bird sculpture is "Life-Size" unless otherwise noted. Hand carved in the USA, these beautiful bird sculptures are proudly displayed at many galleries and private collections around worldwide. Satisfaction Guarantee - If you're not 100% satisfied with your purchase please contact us immediately and we'll make sure you're a happy customer. Lifetime Free Repair Guarantee For Any Birds You Purchased From Us! Customers are responsible for the cost of any parts and round-trip shipping charges. No returns after 15 days from purchase. Returns may be subject to a 20% restocking fee. Shipping, handling and insurance charges are non- refundable. Returns are refunded through store credit only and can only be exchanged for another carved bird sculptured item by the original artist. Item must be returned by registered insured mail and packed well. Item must be returned undamaged and in original condition. We reserve the right to refuse any damaged returns.